I have the perfect gift for any new homeowner, DIYourselfer, man or woman on your list! It is the perfect DIY gift for men that women LOVE to steal! Hang-O-Matic is the hot holiday gift this year! Made for the amateur to get professional results and makes home decoration simple - NO handyman required! This Easy Wall Hanging Tool is the only thing you will need to hang any wall decor in seconds. Stop ruining your walls when trying to hang something straight. Stop spending a lot of money on expensive tape measures and laser levels. 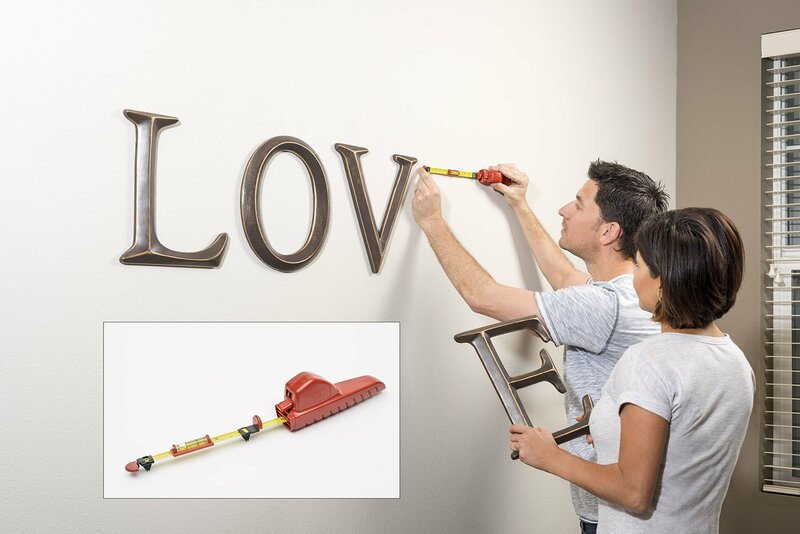 With Hang-O-Matic, you can measure, level AND mark the wall with one tool so you know exactly where the nails go. Hang-O-Matic has a sliding bubble level two metal makers that dimple the wall for you, so you no longer have to forget to put a pencil behind your ear or ask someone to get that for you. Hang-O-Matic does it all for you in three easy steps. Measure, Level, Mark and you're done. Second, use the built in level bubble to level Hang-O-Matic on the wall. With a firm press on both ends, Hang-O-Matic makes two perfect marks on the wall. Then, use any hardware, any size to hang it perfect, every time. Hang-O-Matic is the All-In-One Wall Décor Hanging Tool that precisely mounts Pictures, Shelves, Mirrors, TVs and more. Measure, level, and mark with precision. It’s perfect for the tool-lover in your life, and those who are ‘all thumbs,’ no DIY skills needed! You can purchase the Hang-O-Matic for $14.95 from the Hang-O-Matic website. Hang-O-Matic is generously offering (1) Hang-O-Matic to a lucky winner!